What is Proper Oral Hygiene? What Can Dentures Do for You? What Are My Cosmetic Dentistry Options? What Can Be Done About Excessive or Uneven Gums? Are Dentures Right for Me? Am I a Candidate for Teeth Whitening? Although periodontal (gum) disease is the most common cause of bone loss in the mouth, women at or past menopause face another condition that could cause complications with their oral bone health — osteoporosis. 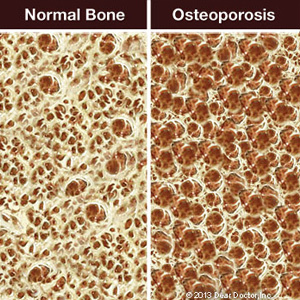 While normal bone goes through a balanced cycle of resorption (the dissolving of bone tissue) and re-growth, osteoporosis, a hormone-induced disease, tips the scale toward resorption. This reduces bone density, which weakens the bone and makes them more susceptible to fracture. Some studies have shown a link between osteoporosis and existing gum disease; however, the greater concern at present from an oral health standpoint regards the side effects of a certain class of drugs called bisphosphonates used in the treatment of osteoporosis. Bisphosphonates slow excessive bone resorption, which helps restore normal balance to the bone growth cycle. Some long-term users of bisphosphonates, however, may develop a complication in their jaw bone known as osteonecrosis in which isolated areas of the bone lose vitality and die. This can complicate certain types of oral surgery, particularly to install dental implants (which rely on stable bone for a successful outcome). While research is still ongoing, it does appear individuals at the highest risk of osteonecrosis are those with underlying cancers who receive high-dose intravenous bisphosphonate treatment every month for an extended period of time. It’s important then that you let us know before any dental procedure if you’ve been diagnosed with osteoporosis and what treatment you’re receiving for it. If you’ve been taking a bisphosphonate for an extended period of time, we may recommend that you stop that treatment for three months (if possible) before undergoing oral surgery. While your risk of complications from osteonecrosis is relatively small, adding this extra precaution will further reduce that risk and help ensure a successful outcome for your scheduled dental procedure.